The newest entry into the booming market for mini .45s is the Springfield Armory XD-S, an XD variant which was designed from the ground up to provide licensed civilians, undercover and off-duty police officers with a large-bore pistol that can be carried concealed easily for extended periods of time. The basis of the XD-S is a one-piece, polymer frame that has aggressive texturing on the sides, and front- and backstraps that provide a secure purchase, even with wet hands or when wearing gloves. Standard features include ambidextrous magazine releases, interchangeable backstraps so the shooter can fit the pistol to their hands and—unique among pistols of this class—a Picatinny rail that allows you to mount lights or lasers. The slide release and takedown levers are serrated for positive manipulation and mounted close to the frame so as not to snag on clothing or gear when the pistol is drawn from concealment. All this isn't so different from other XD variants, but the XD-S offers some significant changes. One, the S in the model name stands for single stack, a change to the magazine design that permits a slimmer grip. For instance, the XD-S has a grip width of 0.945 inch, compared to an XD(m) grip width of 1.185 inches. The Melonite-finished slide is also 0.1 inch slimmer than an XD(m). Frame width or overall width of the gun is a mere 1.0 inch, compared to the 1.17-inch width of the XD(m). And if you compare the height of the XD-S to its closest cousin, the XD(m) 3.8 in .45 ACP, you'll find it's 0.15 inch shorter. These dimensional differences make the XD-S a much more concealable package than previous XD variants, but Springfield didn't stop there. The XD-S also features a fiber-optic front sight for fast sight alignment, target acquisition and transitioning. This is a first for a production pistol in its class. The XD-S has five safety devices: a grip safety at the rear of the frame; a trigger-block safety on the face of the trigger; a plunger type firing pin safety; a disconnecter that prevents the pistol from being fired unless to the slide is completely in battery; and a loaded-chamber indicator at the rear of the ejection port that provides visible and tactical indications of the pistol's condition. The XD-S also features a redesigned Ultra Safety Assurance trigger with a shorter take-up, crisper let-off, reduced overtravel and a short reset that can be felt and heard by the shooter. My test sample arrived in a padded carrying case with two spare magazines, interchangeable backstraps, holster, magazine pouch, replacement fiber-optic inserts, lock and owner's manual. The company also sent along one of the optional seven-round magazines. These have a sleeve that approximates the outside diameter of the grip frame and provide additional firepower while enhancing recoil control. The XD-S was tested for accuracy from a rest at 15 yards, and I was pleased to see that it printed to point of aim for all four types of ammo. 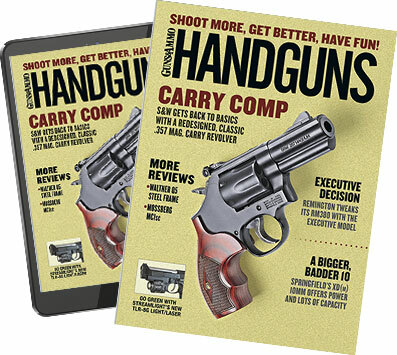 After chronographing was completed, I belted on the holster that came with the pistol and ran it through my standard series of offhand drills at five and seven yards, firing the pistol with two- and one-hand grips. I am a big fan of fiber-optic sights, and as can be seen in the photos I had no trouble at all putting all but one of the rounds I sent down range in the X and nine rings of a pair of combat targets. The recoil from launching heavy projectiles from a 21.5-ounce pistol was obvious, which brings up the only negative comment I can voice about the Springfield XD-S. With the five-round magazine I could not get a full three-finger grip on the pistol, which naturally had a detrimental effect on recoil control. With the extended magazine the XD-S handled recoil like a full-size pistol, and I would suggest that anyone using one of these mini Springfields for concealed carry consider purchasing one of the seven-round magazines and carry it for a reload. Over the next few weeks my shooting buddies and I ran in excess of 600 rounds through the XD-S, and I am happy to relate that I am still waiting for the first malfunction. I can only call such performance from an out-of-the-box pistol extraordinary. Other than that one caveat regarding recoil control with the five-round mag, I believe that Springfield Armory has yet another winner with the XD-S. If you want a small, light, concealable pistol for everyday carry—and want it chambered for the most highly respected combat pistol cartridges of all time—the XD-S might just be the ticket for you.